Nineteen-year-old Derrick Redcay picked a perfect spring day to stop by Ladder 23 in Chinatown. A volunteer firefighter in his hometown of Muhlenberg Township, just like his dad, Derrick was looking forward to paying a visit to his pals at the station, after they had visited him so many times during his stay at Magee a year ago. 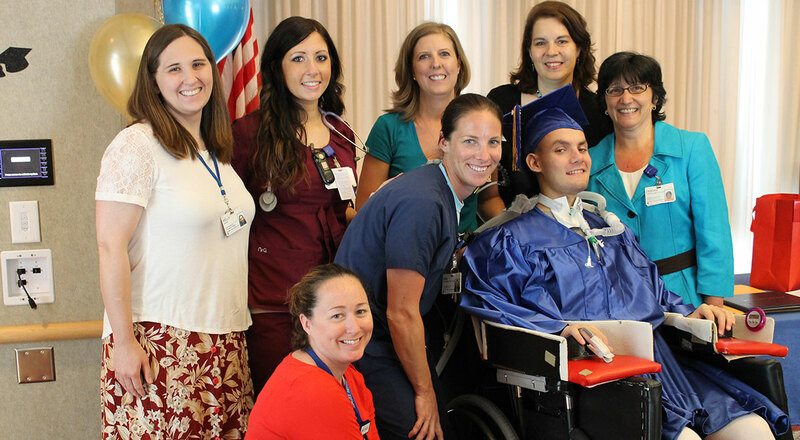 Derrick came to Magee after a rare stroke to his spinal cord on April 24, 2014. He remembers waking up that morning with a stiff neck. A senior baseball player at Muhlenberg High School at the time, Derrick sailed through first period not giving it much thought, and even second period gym class was fine. But he soon began to feel numbness in his arm and went to the school nurse for an ice pack. By the afternoon, he was completely numb and rushed to St. Joseph’s Medical Center in Reading, PA. A helicopter took him to Thomas Jefferson University Hospital in Philadelphia, where he would spend 10 days. The stroke had severed Derrick’s spinal cord nerves at the C4-C6 area, leaving him with no sensation or movement below his neck. Derrick arrived at Magee on a ventilator. With help from the Segal Housing Fund, his parents would stay every Friday through Sunday at the Sheraton across the street for the next three months, taking careful notes from Derrick’s care team on how to help him through all of his daily activities. As different as life had become for Derrick, his family and the team at Magee worked to make sure they could keep some parts of his world as normal as possible. His stay spanned the final months of his senior year of high school. Visits from countless friends, including the firefighters of Ladder 23, kept him busy when he wasn’t in therapy. When it came time for prom and graduation, the party was brought to Derrick. Concierge Services arranged a simulcast of the commencement ceremony straight from Muhlenberg High School, and Derrick donned a bright blue cap and gown just like his classmates when he was presented with his own diploma in Magee’s 6th floor Board Room. While Derrick grew stronger at Magee, his community back home in Muhlenberg Township was coming together to support the Redcay family in ways they could have never imagined. Three days after Derrick’s stroke, a local construction company, Forino, began work on an accessible addition to the Redcay home. A local car dealership, Savage 61, raffled off a brand new Dodge Dart, raising $50,000 for the Redcays to purchase an accessible van. The perfect ride was all the way in Kalamazoo, Michigan, able to accommodate Derrick’s power chair and complete with TVs, a DVD player, and headsets inside. Derrick’s dad drove 629 miles, each way, to bring it home. “Redcay Strong” grew to be a battle cry for Derrick’s supporters. The website RedcayStrong.org became a hub for updates on Derrick’s condition and ways to help. Friends and neighbors coordinated who would bring the family hot meals and when, so Derrick’s parents and brother could focus on his care. They supplied the Redcays with three months’ worth of home-cooked dinners every night. “We can’t describe the way the community came together,” Deb says. Derrick returned home to a hero’s welcome on July 29, 2014. Sirens heralded his arrival, and well-wishers lined the street, cheering Derrick on with balloons and signs. Today, Derrick can move both arms and breathe on his own for most of the day. He has OT twice a week. On weekends, he’ll hang out with friends and watch movies. He was the grand marshal at the town’s Halloween parade and has been to his girlfriend’s soccer games and visited his former teammates on the varsity baseball team. Derrick’s coach spoke to him almost daily while he was at Magee. Every baseball player in the Muhlenberg School District wore Derrick’s number, 22, on their jerseys in his honor. Right now, Derrick and his parents are researching colleges with ADA programs. Michigan State University and Edinboro University in northwestern Pennsylvania both look promising. He’s also considering attending college online.